Leading Manufacturer of 925 sterling silver designer bracelet, heavy designer bracelet, 925 sterling silver bracelet, 925 sterling silver fancy bracelet, silver designer bracelet and 925 sterling silver designer brod kadas from Mumbai. 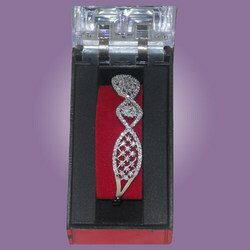 We are a distinguished firm occupied in manufacturing an exclusive range of 925 Sterling Silver Designer Bracelet. These bracelets are well designed by our experienced craftsmen. Our designers are proficient and know about all the details regarding this designing pattern. These bracelets are crafted in adherence with the latest market trends. 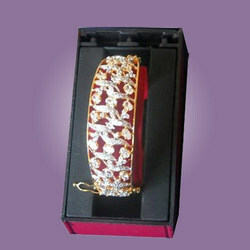 Being a client centric firm we are offering a comprehensive range of Heavy Designer Bracelet. These are beautifully designed and are available in eye-catchy patterns as per the choice of our patrons. Our products are highly admired amongst the clients for their attractive designs and patterns. We offer them to our clients in the committed time frame to meet the market demand. We are counted amongst the top companies involved in offering an extensive range of Silver Bracelet. These are manufactured using high grade material and latest technology to render maximum client satisfaction. Our entire product range has exceptional finishing and is well known due to their trendy looks. Moreover, we offer them in different sizes at feasible prices. For the diverse requirements of our clients we are involved in offering an excellent range of Fancy Bracelet. These are designed as per the latest fashion trends prevailing in the industry to meet the variegated preferences of our clients. 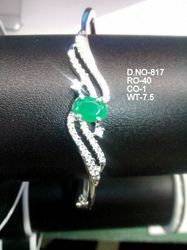 These are available in different enchanting designs as per the requirements of our esteemed customers. Furthermore, we offer them at pocket friendly rates. Our company has designed a unique product Silver Designer Bracelet to append and respond to the emerging demands of honorable clients. 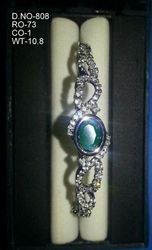 These bracelets are crafted using high-class gemstones that are obtained from reliable vendors of the market. Our valuable clients can avail these bracelets from us at nominal prices. Our company has designed a unique product, Designer Bracelet to append and respond to the emerging demands of honorable clients. 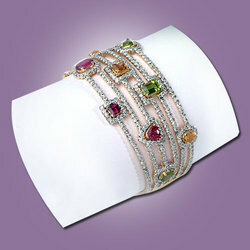 These bracelets are crafted using high-class gemstones that are obtained from reliable vendors of the market. Our valuable clients can avail these bracelets from us at nominal prices. 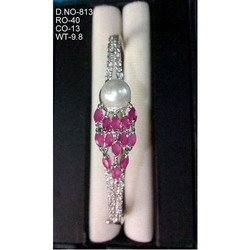 Our company has earned widespread appreciation by offering premium quality Quality Designer Bracelet. These bracelets are manufactured by pure metals and other precious & semi-precious embellishments, procured from accredited vendors. 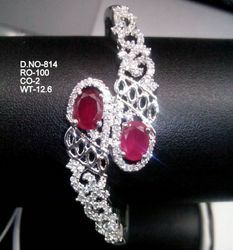 These bracelets are known among the clients for their fine finishing and alluring patterns. We are engaged in manufacturing Designer Brod Kadas, which is manufactured using optimum quality raw material. These kadas are intricately designed to instantly attract the attention of others, hence giving a sense of confidence to the bearer. Available in various patterns, colors and sizes, these kadas are very nominally priced in the market. We bring forth finest quality Antique Kadas that are widely demanded due to its superb polishing and finishing among the clients. We offer it in different designs and sizes. We offer an artistic design Designer Bracelets which are studded in rhodolite garnet stones and manufactured in 10% pure 24K gold and premium imported English alloy which gives it a steel-like finish. Looking for Designer Kada-braclets ?